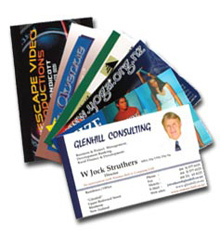 We offer full color business cards in quantities starting at 500 per version. Choose any paper we offer for one low price. Print one side or two in photo quality. All of our business cards are printed in full color, either 4/0 or 4/4. We do not offer spot color printing, so all business cards will be printed on a full color press regardless of the number of colors used in your design. We are only able to print business cards from files with crop marks or from professional page layout and illustration programs which generate crop marks. Sorry, no Microsoft Office files.